Ok...this is what I did when I relocated the battery on my 91 Toyota truck to the bed. First I stared by jacking the truck up &amp; putting it on 4 jack stands...this will make it so much easier when your running the wire. 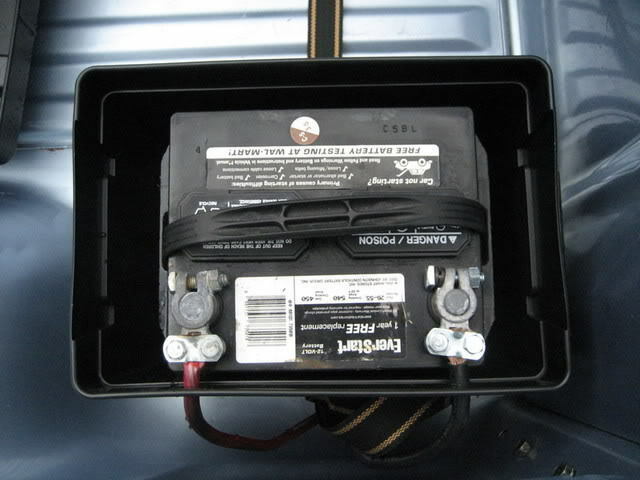 After getting all the done I then mounted the battery box where I wanted it...as you can see in the pic. 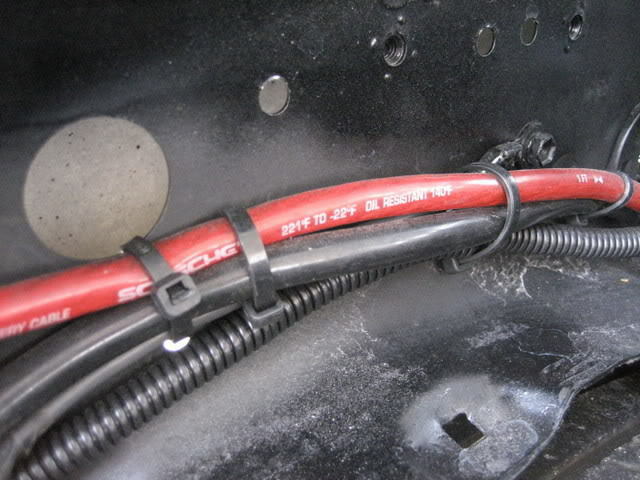 After I got the battery box installed I ran both the 4 gauge power wire &amp; ground wire to the front of the truck. This is where it the extra wire comes in handy cause you'll need to run the wire all above the frame &amp; out of harms way!! 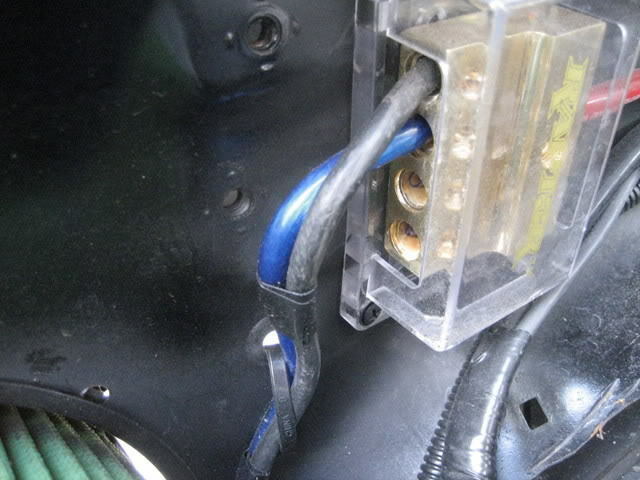 *Do not use anything smaller than 4 gauge wire for both power/ground wire!!!! Now you see where the 2 terminals came into play. Ok...now that I got the wire ran, I then mounted the power distribution block on the inner fender well. I bought this from a local stereo shop &amp; the guys there were very helpful cause I told them what I was doing so they made sure I got the right size block for the wire I was going to use. As you can see in this pic there is a large (red) wire leading to the distribution block-that's the power wire. You don't have to do what I did next, but I found it easier. Instead of grounding the battery in the rear I ran the ground wire to the front &amp; used it to ground the starter. I figure why have two grounds when I could do it all in one! Like I said you don't have to do it that way...you can ground the battery in the rear &amp; then ground the starter to the frame...both ways work good! So...after I got I got the starter grounded &amp; the power wire run to the distribution block. I then ran the power wire from the starter &amp; the power/main wire from the fuse box-(don't forget about that) to the distribution block as well. 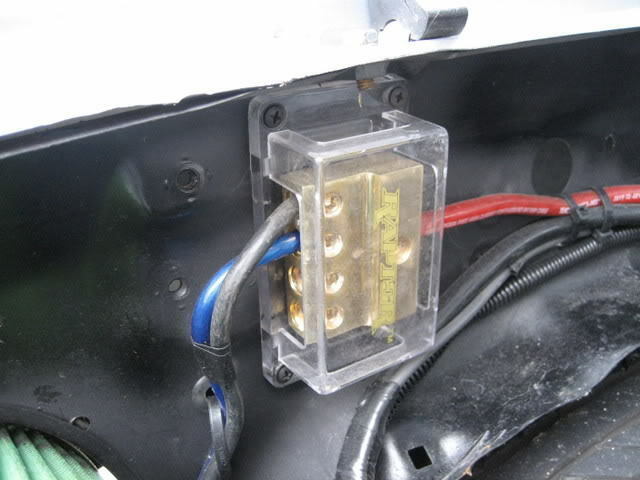 As you can see from the pic I've got all the wires installed in the distribution block, the two smaller wire are coming from the fuse box-under the hood &amp; the other is the power wire from the starter. Yea...I forgot about the wireloom lol. 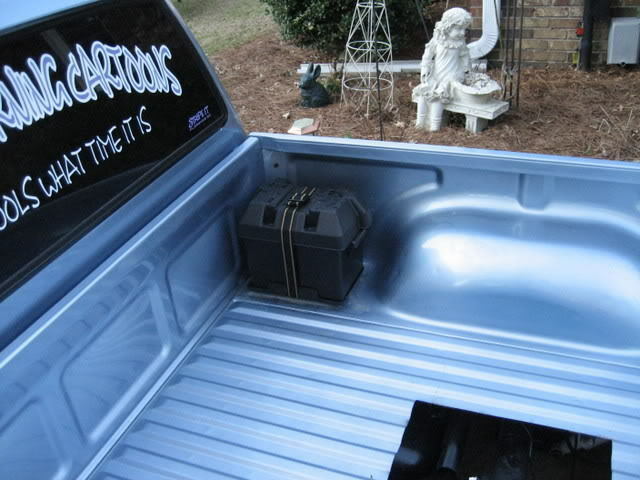 I used the wireloom to cover the wires in the rear &amp; front so they wouldnt rub on anything! Thanks for pointing that out bro! 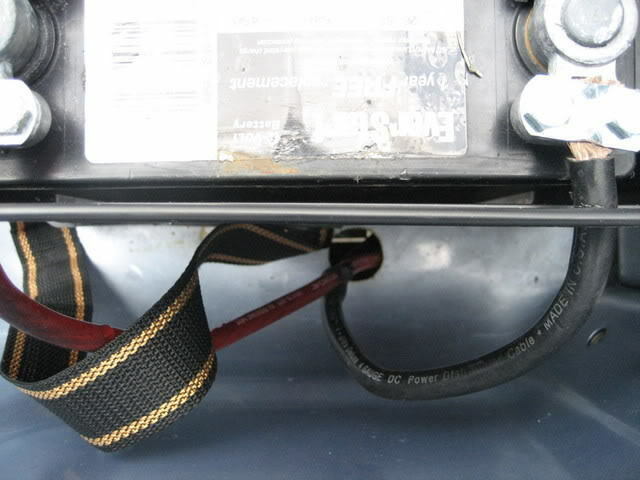 have you noticed any problems with grounding that battery in the front and not in the rear? I have mine grounded in the rear because i was afraid of potental issues. Nope...no problems at all &amp; mines been this way since June of 07. Like I said before its all about choice &amp; I guess if your running a large stereo or have bags then the more grounds you have would be safer, but I have neither at this time! Word of causation, hot wire &amp; ground tied together! If the positive lead gets hot enough to burn through right next to the ground lead,you are going to have a big problem!! Also with battery that far way, I would run a larger cable 0 or 1 Ga. , just what I was told &amp; did!! or ground(additionally) to the frame directly under the bed. the more the merrier as they say. I doubt your positive wire would get that hot, chafing off the jacket would probably be more likely. either way, if the positive is run along the body or frame, its basically that same as running with the ground. I don't see much problem running them side by side if adequate grounding is done. as long as the wires are protected, looks pretty good to me. I havent had any problems with my setup &amp; all my wires are run well above the frame front to rear. You can run a bigger wire than 4ga, but the factory wires are like 10/12ga so what I used what was large enough for me. 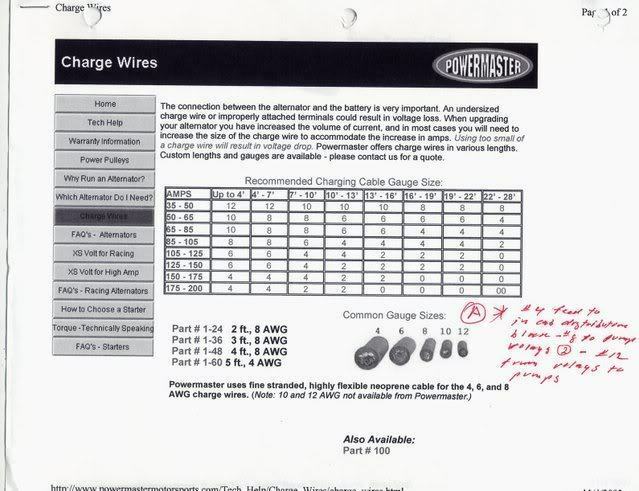 Oh here is something to help you guys to decide on what type of wire you want to use!! I just grounded mine to the frame in the back with one of those fancy ground straps and grounded the stock ground wire off the engine to the frame in the front and i've not had a problem with it, yet I haven't got to run mine very long either. I plan on adding more grounds to my engine though just because it heps with performance and what not. you can get one of those fancy billet aluminum battery holders for Optima I think Summit Racing has them. They're expensive but nice, I was thinking about getting on for mine but my battery is under my bed so it would be kind of pointless because you wouldn't be able to see my battery anyway.